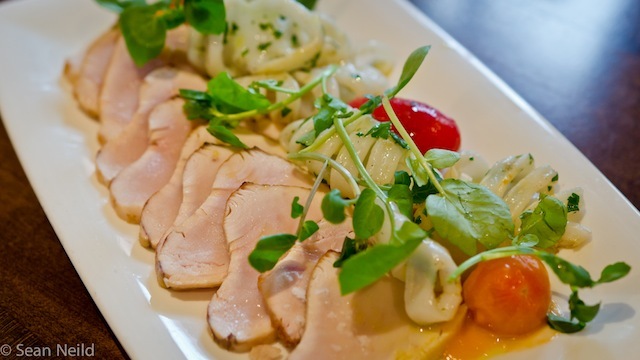 Dining “family style” is a quintessential part of the true Italian dining experience and La Pentola Della Quercia at the OPUS Hotel is bringing this to a whole new level with the Famiglia Supper Series. 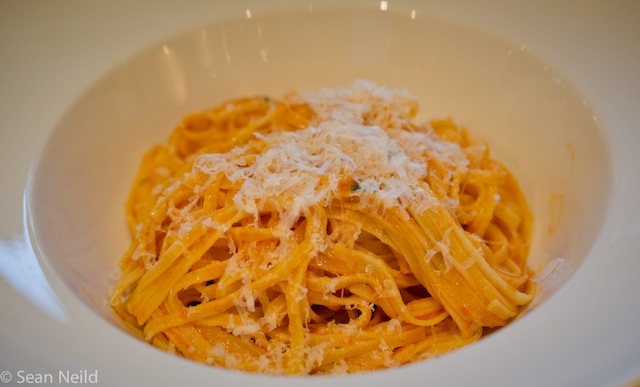 The $55/person dinners take place the last Sunday of every month and are centered around a great Italian ingredient or producer with a 8+ course meal being served. This dinner was a collaboration between Chef Lucais Syme, Stoney Paradise Farms and Fiore Fine Foods. Eating in Vancouver was invited to attend this Yaletown dining experience, so when I got the opportunity to dine with fellow EiV editor, photographer and friend Alvin Lee I knew we were in for a great night! 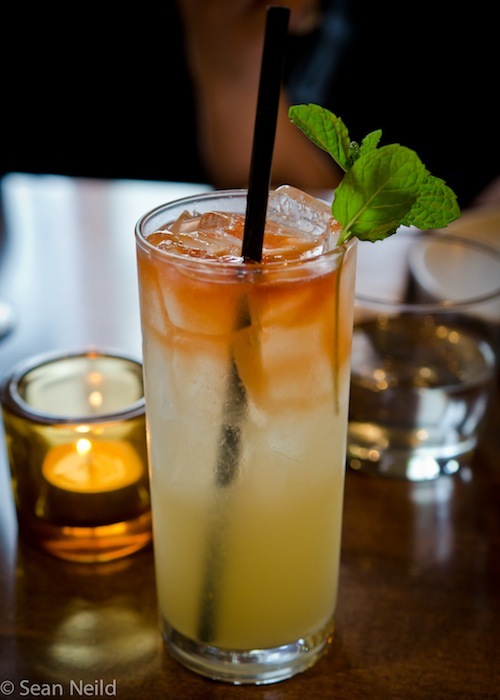 Drink wise I enjoyed La Pentola’s Moscow Mule – the ginger beer had a nice natural ginger bite with a refreshing, not overly sweet finish. The featured ingredients of the night were Domenica Fiore Italian Organic Extra Virgin Olive Oil and Summer Heirloom Tomatoes. Domenica Fiore Olive Oils are artisan grown, milled and blended on a family owned estate overlooking the medieval village of Orvieto in the Umbrian region of Italy. 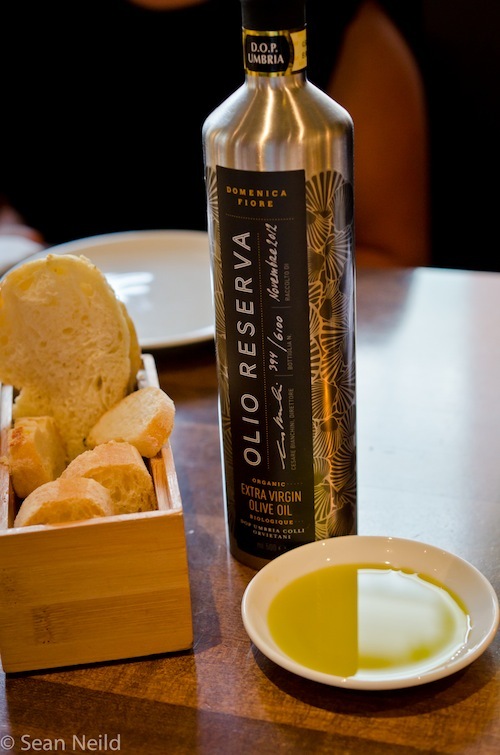 The oil was named Best Olive Oil in the World in 2013 at a prestigious New York International Competition with over 700 oils competing from 22 countries. The commitment to quality is unlike any I’ve seen with other EVOO producers. The oil is packed in 18/10 stainless steel bottles and topped with a nitrogen seal to ensure premium quality freshness. Additionally, each bottle is numbered and hand signed by the producer. 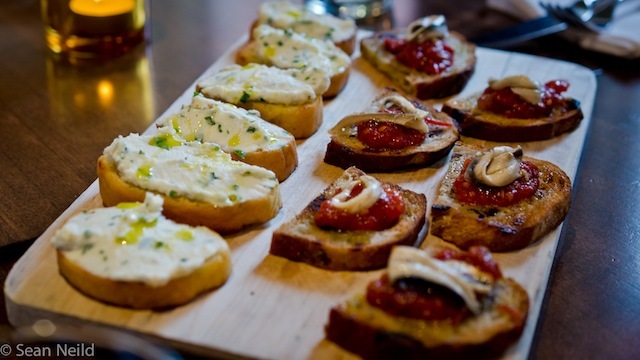 To start, we enjoyed a duo of crustini – ricotta cheese with herbs and Domenica Fiore Reserva as well as a White Anchovies and Tomato Jam. The ricotta crustini was absolutely delicious with the mild, creamy and slightly sweet cheese being the perfect pairing with the fruity Domenica Fiore Reserva. The anchovy crustini was more on the sweet side with the tomato jam handling that part of the bite, while the fresh anchovy was clean with the essence of the sea rather than the usual saltiness of the preserved version. For course two, we were served a Soufflé Di Parmigiano on a balsamic reduction and cucumber salad. This is a smaller version of an item on the regular menu. 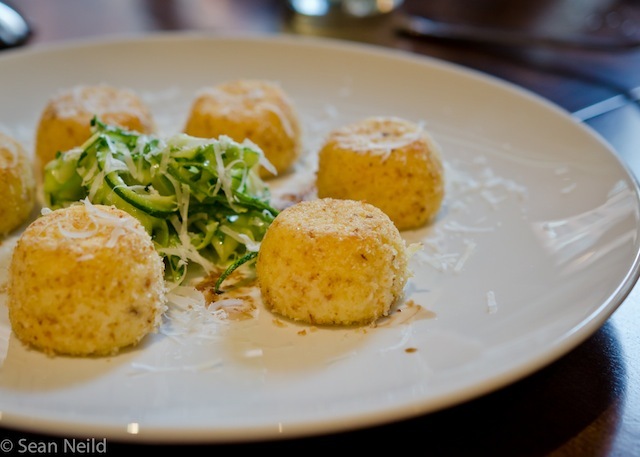 They were beautifully light and airy with the parmesan being the star of the bite as it had a nice saltiness to it. To break up the richness and add some texture, the balsamic reduction along with the cucumber salad were great choices. The third course up was the classic Caprese Salad with Mozzarella di Bufala, assorted heirloom tomatoes and some Domenica Fiore Reserva. With the heirloom tomatoes adding such a variety of different flavors, this was a nice change from the usual red tomatoes. 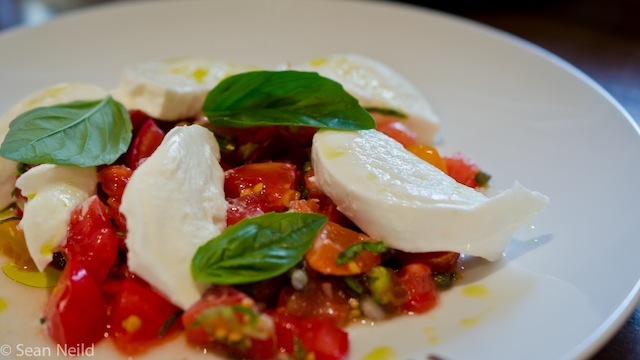 The buffalo mozzarella was creamy and rich and complimented the earthiness of the tomatoes. Moving on to some seafood and our forth course was the Seared Tuna and Basil Marinated Grilled Squid. For me the star of this plate was the squid because it was tender and the basil marinade really added great flavor. The tuna for me was a miss as it was overall flat in taste and dry from being overcooked. 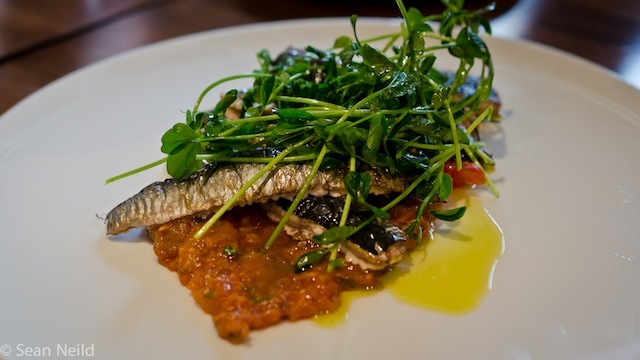 Course number five was another fish course, Grilled Sardines on a Tomato and Eggplant Caponata with a Pea Shoot Salad and Domenica Fiore Reserva. Everyone at the table enjoyed this dish but I didn’t indulge for personal tastes. The risotto and pasta course were served next, beginning with an Organic Zucchini Risotto garnished with Zucchini Flowers and Romanesco. This was my favorite dish of the night and has to be one of the best risottos I’ve had in my life. 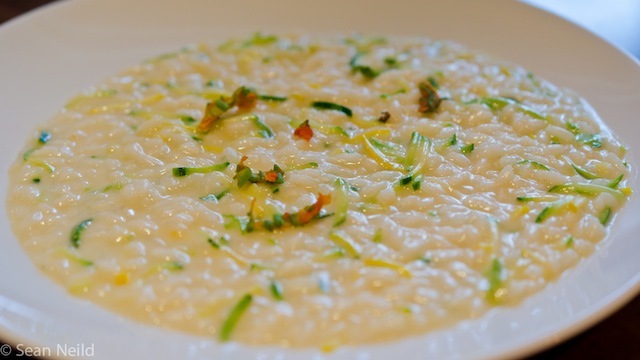 The zucchini added a nice sweetness to the risotto, and combined with the perfectly cooked rice made the dish silky without being overly rich. For the pasta course of the night, we were served a Linguine in a freshly made Heirloom Tomato Sauce. This was a meat free sauce that really showed off the tomatoes. The pasta was cooked beautifully with it being perfectly al dente and being in-house made and freshly dried. 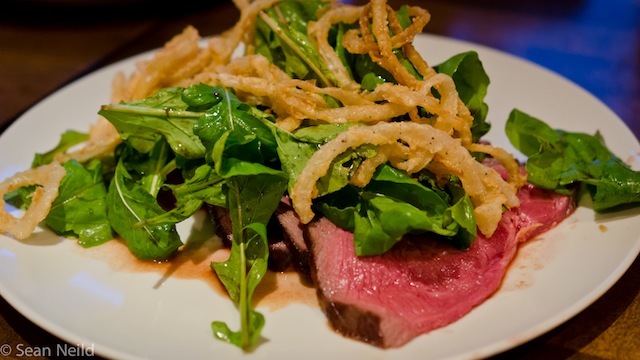 The meat course and number eight of the evening was a AAA Rib Steak with Crispy Fried Onions and Greens. They cooked the meat medium rare which left it nice and juicy. The greens were lightly dressed with Domenica Fiore and lemon, which I liked, but the onions for me were out of place and slightly dominated things flavor wise. Finally for dessert we were served a Tomato Sorbetto with Chocolate Ganache and Domenica Fiore Reserva that was turned into a powder! This dessert was something really different for me. 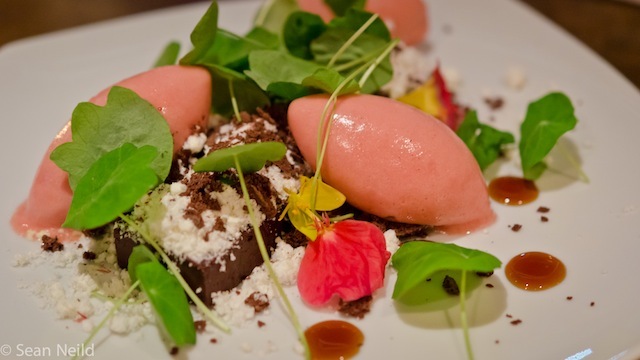 Never having tomato sorbetto, I found it wasn’t sweet and when combined with the chocolate ganache, it made for a great bite. The olive oil powder for me was the odd flavor in the dessert. I found it stood out too much even when combined with every component. 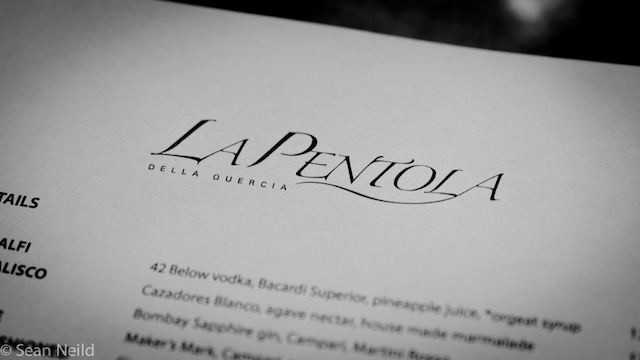 Overall the dinner was delicious and included a variety of dishes that both represented the featured ingredients as well as the La Pentola Della Quercia and Chef Lucais Syme. Our table was full of laughs and conversation with everyone thoroughly enjoying themselves – this was also the case at every table around us! The Famiglia Supper Series runs every last Sunday of the month. Further information and tickets can be found here.